The answer can be found in what you do every day. New cyber threats are constantly emerging, putting your network security to the test and your organization under attack. Far too often, organizations don't understand the financial impact of cybercrime. The average company suffers losses in excess of $3 million in the aftermath of a data breach. For small businesses, the number is $42,000. Many companies believe they lack the expertise and human resources needed to take a proactive approach to information security, and only discover their vulnerabilities—and get serious about securing their environment—after suffering an attack. The SLPowers suite of Managed Security Services allows you to focus on your day-to-day operations, while our team of security experts manages the critical components of your organization's security posture. In 2014, US-CERT (the United States Computer Emergency Readiness Team, which is part of the Department of Homeland Security), released their Continuous Diagnostics & Mitigation program, stating that continuous diagnostic monitoring and mitigation is the only true method for securing a cyber environment. In fact, we’ve been monitoring our client environments for security anomalies around the clock since 2011. For companies needing to step-up their security posture, SLPowers has developed Guaranteed Networks–Secure, a comprehensive and flexible suite of managed security offerings. It includes Advanced Firewall Management, and 24x7 monitored Intrusion Detection and Prevention Services (IDS/IPS), coupled with a cloud-based SIEM (Security Information & Event Management) solution. Our sensors analyze your network looking for suspicious activity, keying on symptoms of malicious intent, and running all activity through a sophisticated event correlation engine. Whenever potentially harmful actions are identified, an automatic notification is triggered within our Security Operations Center (SOC), which takes immediate action to discontinue and/or contain the potential security breach. Real-TIme Monitoring: The SLPowers 24 x 7 SOC (Security Operations Center) is manned around the clock, analyzing your network and ready to bounce intruders. Event Correlation: Sometimes innocent looking events aren't. When several of them are happening at once, our event correlation engine alerts us on potential threat conditions. Emerging Threat Intelligence: We receive emerging threat feeds from around the world, stopping newly-discovered threats without having to discover them ourselves. Zero Day Protection: Because we analyze your network continuously, looking for malicious activity, we don't have to rely on common signatures to eliminate unknown or targeted threats. An entire department of security professionals looking after your network security around the clock. In the current threat landscape, simply plugging in a firewall and then forgetting about it could be considered negligent. Every firewall has a number of maintenance tasks that need to be performed regularly. If your business has multiple locations, as do many healthcare, banking, and retail companies, these critical tasks can become complicated and time consuming, thus easy delayed and eventually forgotten. Most firewall appliances now include "UTM" bundles, a series of add-on features designed to provide Unified Threat Management. These additional features provide extra layers of protection for your network—but also added levels of complexity when it comes to managing your firewall. With cybersecurity challenges mounting so rapidly, it's critically important to take full advantage of the full range of your firewall's capabilities. Advanced Firewall Management from SLPowers can help by implementing and managing these services for maximum protection and minimal business impact. If your organization is required to collect, review and archive network logs for HIPAA, GLBA, SOX or PCI compliance, you understand the challenges associated with this undertaking. And you probably know that in most organizations (not yours, of course) it isn't being done thoroughly, efficiently, or on a timely basis. Logs come from distributed sources, in varying formats, from any number of locations, and each of those factors can change at any time. Gathering and normalizing the data so that it can be properly analyzed isn't easy. Reviewing logs can be a tedious and thankless task, requiring an experienced analyst working with expensive software. According to the SANS Institute, only 31% of corporations that collect security logs ever review those logs. We collect your logs, we normalize the data, we review your logs and alert you to any areas of concern in a timely manner. We then archive and retain your log data for whatever period of time is mandated by your compliance requirements—or longer, if you so desire. One of the most common ways data ends up in the wrong hands is by misplaced hard drives. This mostly happens through stolen equipment or lost laptops. Even if the finder of a laptop is unable to login to that laptop, it is possible to remove the laptop's hard drive and access the data directly using another computing device. The solution: Managed Disk Encryption by SLPowers. 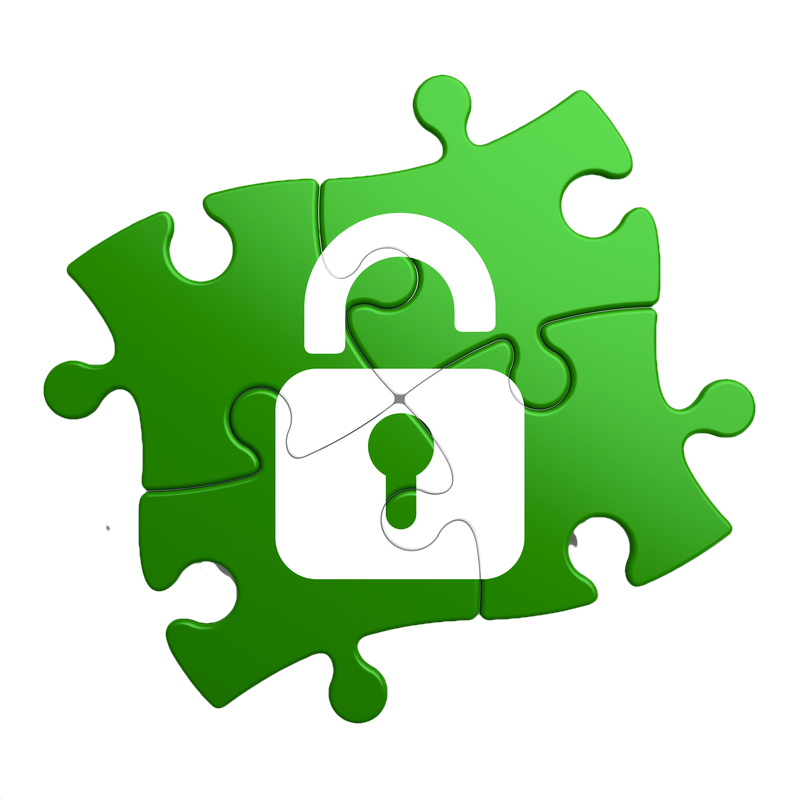 Encryption itself is not difficult and there are many options for effectively encrypting data. The challenging part is managing the encryption keys, getting the right keys to the right authorized users, and, most important, managing the encryption key lifecycle from creation, through active use, to deletion. Remember, encryption adds protection for your confidential information, but it also adds another layer of complexity when it comes to manipulating and keeping your data properly backed-up and accessible to its authorized users. Enforces encryption policies, whether data resides on system drives or external media. Extends corporate policies on external media no matter where your employees are. Meets Federal Information Processing Standard 140.2 for endpoint disk encryption. SLPowers Managed Disk Encryption services consist of a comprehensive suite of fully managed encryption systems and methodologies designed to keep your at-risk data private, even in the event it falls into unauthorized hands. And this includes removable media. Just when you've established a state-of-the-art security posture, locked down and truly secured your network, management decides to embrace the BYOD (Bring Your Own Device) world. Suddenly the office staff starts showing up with Surface tablets, salespeople begin using their own iPads in the field, and managers bring in random combinations of Android and iOS devices. Everyone in the company uses a different kind of smartphone, but they all want to access their email. All too often the arrival of BYOD leads to poking holes in a company’s security so that their mobile users can get to work. But allowing BYOD mobile users to be productive doesn't mean having to soften your defenses. Just an unknown persons are denied access to a secure facility, SLPowers Managed Network Access Control allows only limited or escorted mobile users into your computing environment—provided, of course, that they meet your safety requirements and behave themselves. Otherwise they will be quickly escorted out and banned. These controls are not limited to BYOD devices. All users, including on-premise PCs and trusted mobile devices, are monitored for proper credentialing, adherence to policies, and acceptable behavior. Those that fail to measure up on each count are denied access. 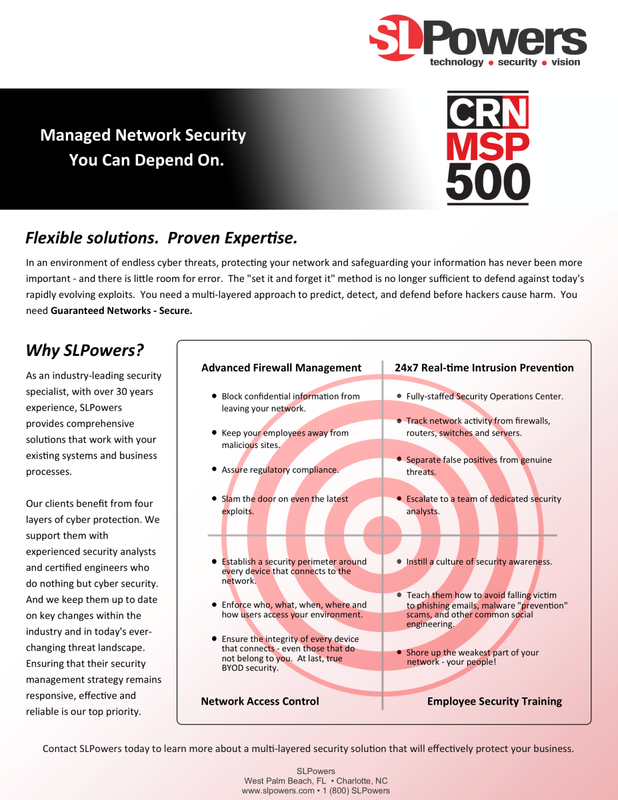 To learn more about SLPowers Managed Network Access Control, or any of our other managed security services, contact your SLPowers account manager at (800) SLPower(s).